This is the “Week of the Bench” as I am joined at The Barn by old friend Dave Reeves and newer friend Jason Weaver, who is the webmeister of this site. 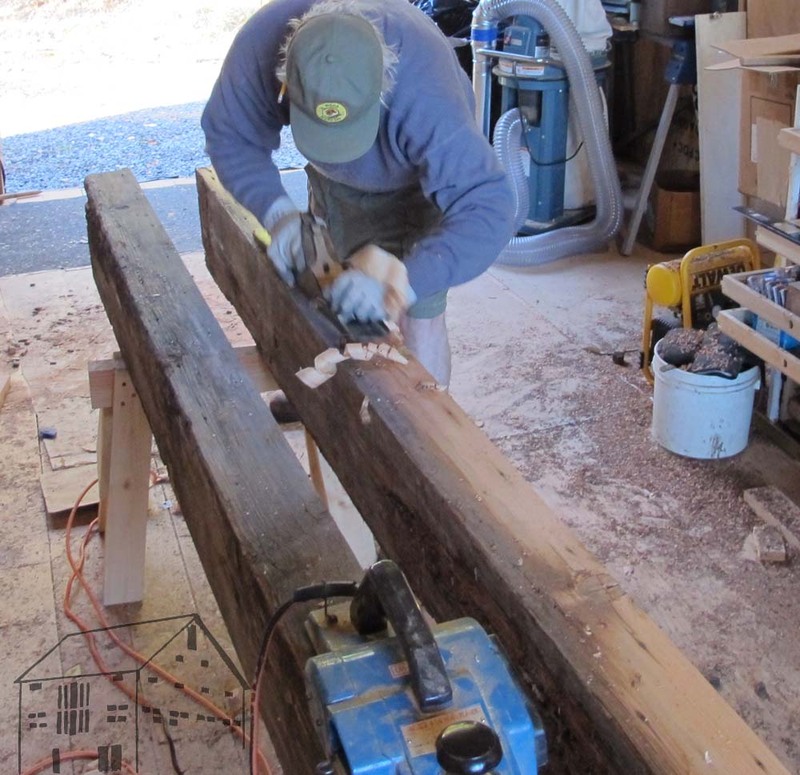 When I asked Jason to design and construct the site, one thing he asked for was to spend time at The Barn “learning stuff.” This is the first installment. 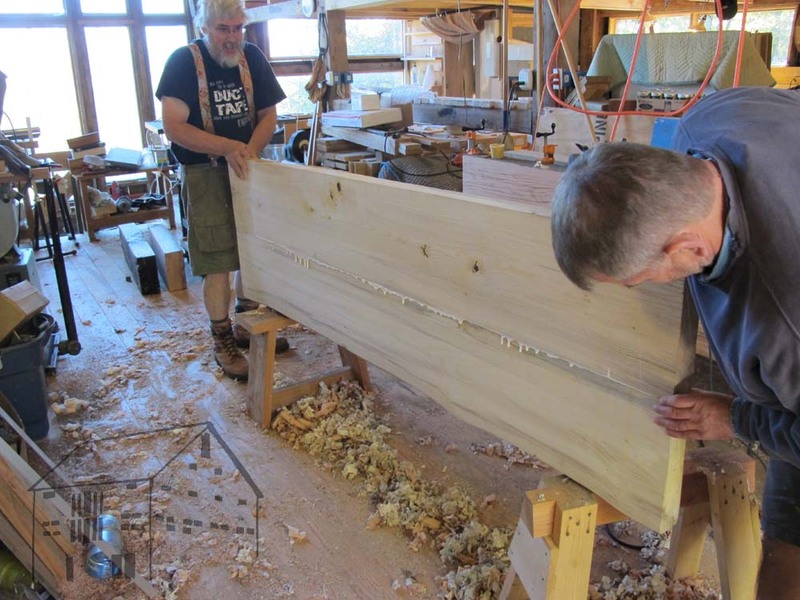 Three guys trying to finish two benches in five days. hmmm. 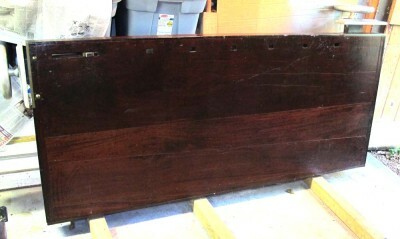 I’ve been assembling a nice inventory of large-ish hunks of lumber, and a stack of vintage (salvaged around 1950?) 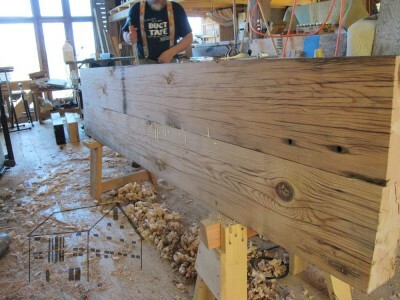 12-foot long 5×12 Douglas Fir beams struck me as a nice starting point for a Roubo bench, and Jason agreed. The end result will be (we hope) a ~8-foot Roubo bench with a pair of Benchcrafted vises. Dave had somewhat different bench needs, as a successful furniture restorer he did not need a massive behemoth like a Roubo, so he is making a lighter weight version of the same concept. He arrived with a pair of 3-1/2″ hackberry (!) slabs and a bunch of other timbers to make his bench. 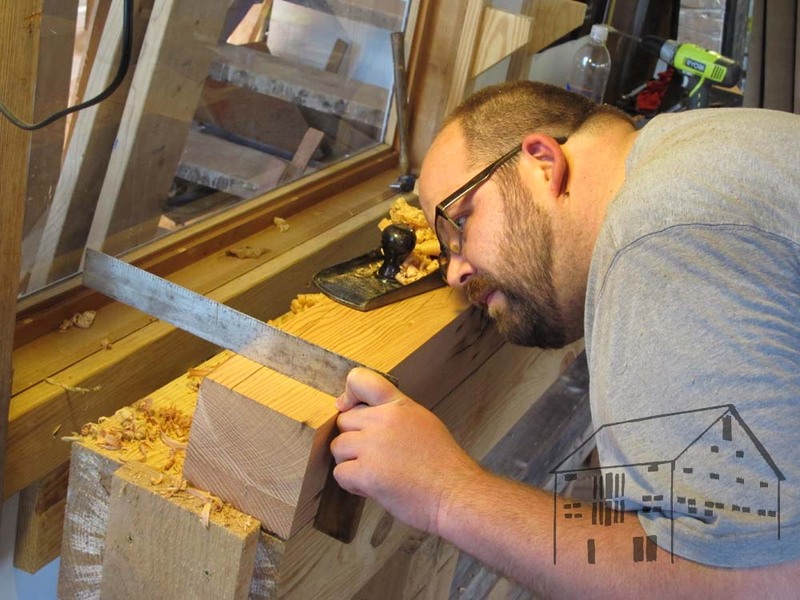 His only vise will be a leg vise with an Erie Toolworks screw. I promised a fairly vigorous if not brutal pace of work as we all worked side-by -side, and thus far we have kept to that promise. We began Monday evening by running all the slabs through my friend Tony’s giant planer, and Tuesday morning we set to getting them glued up. 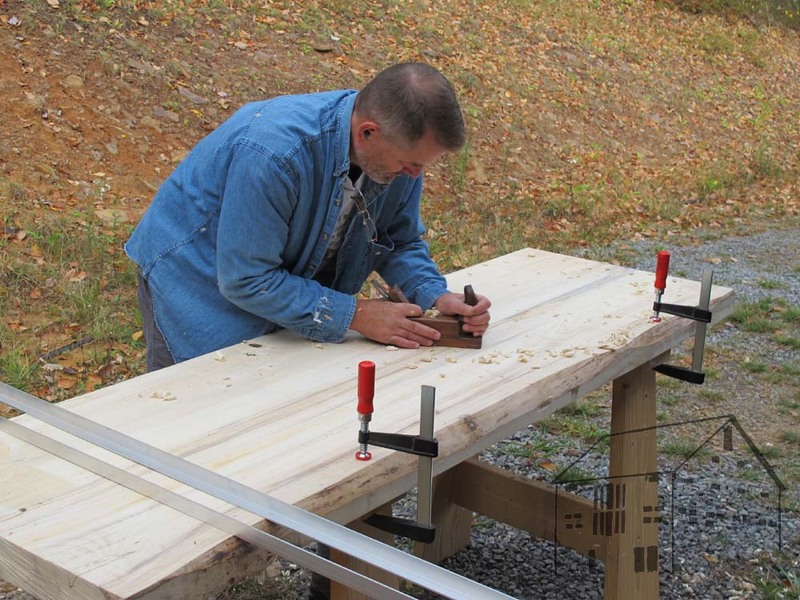 My Ryobi 6-inch timber framer’s portable joiner was conscripted for the task, along with a scrub plane, and #5 set up as a fore plane, and a #8. 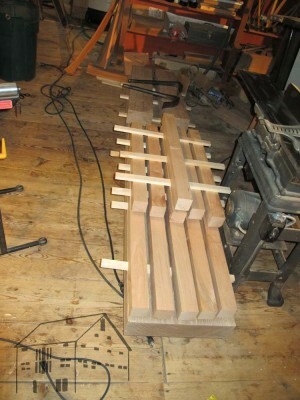 By noon we had them glued up and set aside, with leg stock prep on tap for the afternoon. The afternoon was all about getting leg stock flat, square, and true. Both guys made progress, with the goal for today being the readiness of all the leg stock and a good start on flattening the glued up slabs. While our choreography was a bit off in the steps, we done good. By the time we stopped for dinner both tops were flat, and legs were coming together nicely. 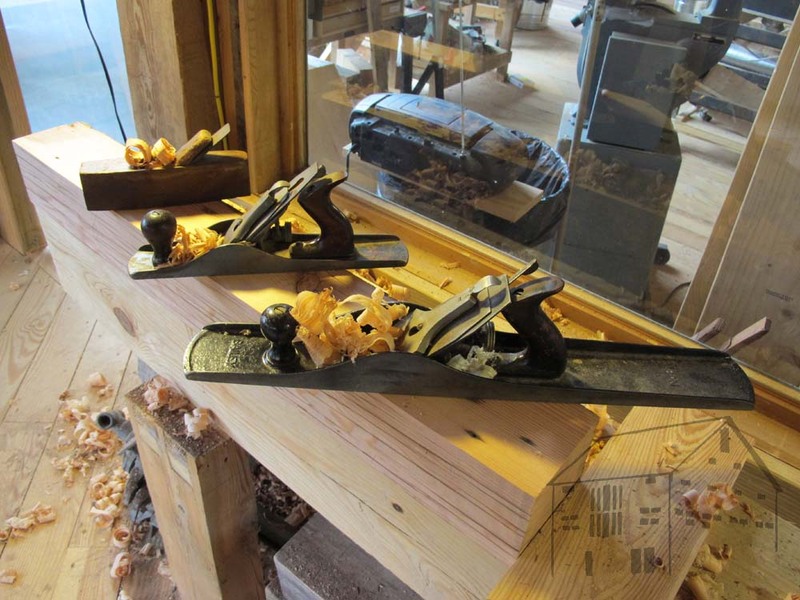 Again, the typical progression was from a coffin plane set up as a scrub plane, a #5 used as a fore plane, and a #8 jointer to finish things off. This is pretty much what you want to see coming off the blade when trueing up. As we finished last night the sky was ablaze with an azure and fluorescent pink composition with a crescent sliver of white highlight. Today was all about keeping things moving forward, fast. To help with the cleanup problem we hauled the bench tops outside to keep the mess out there. 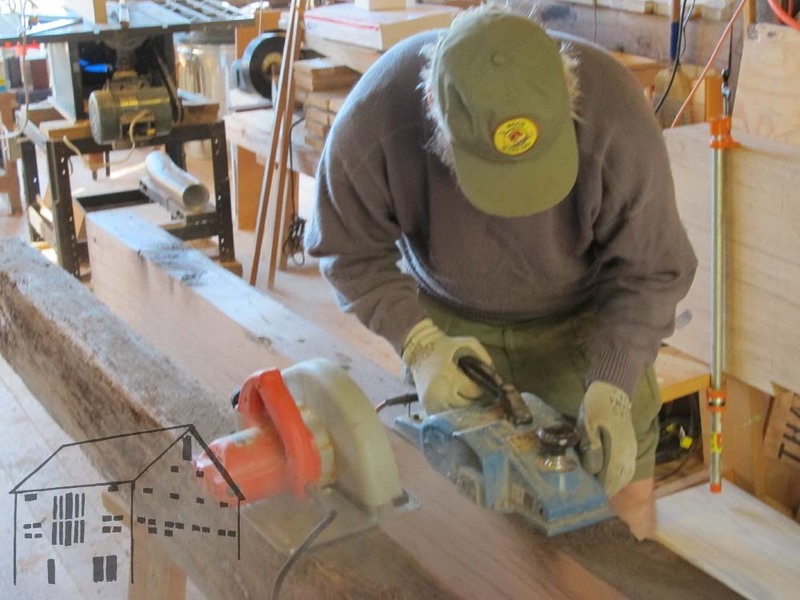 Both ends of the tool spectrum, with me using my power planer to hog off a lot of stock in a hurry, with Dave in the background using a horned wooden plane set up as a shallow-cut fore plane. 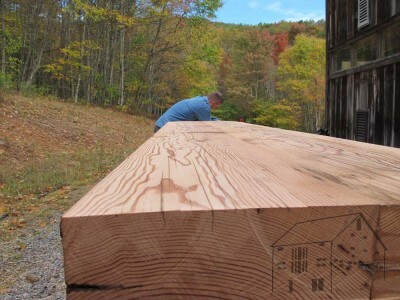 The slabs of Douglas Fir are going to make a spectacular bench. I will probably be using it at WIA next week. 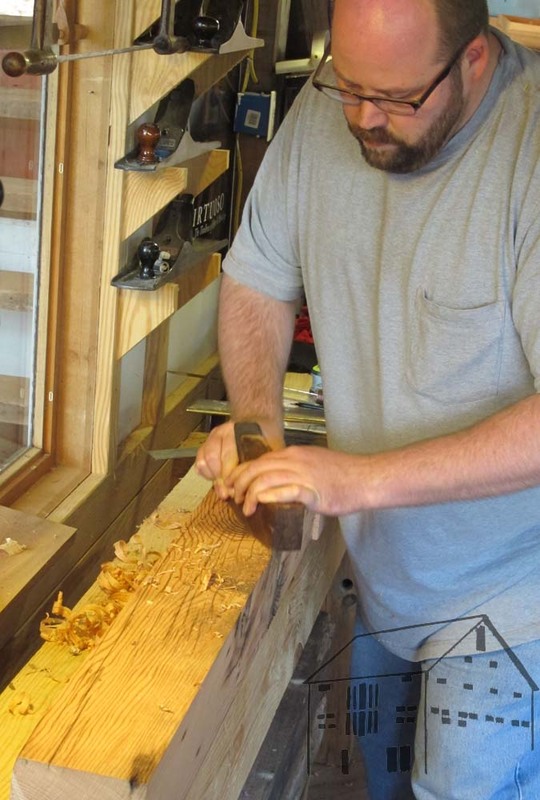 While both guys were busy, I snatched some time to finally flatten my very first Roubo bench from several years ago. I will add a crozet and some dog holes on the left leg. 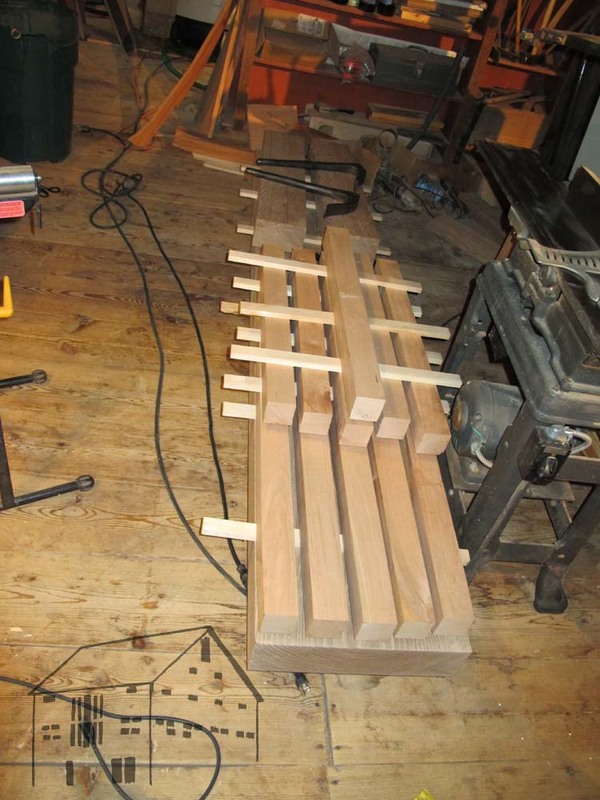 Dave trued his legs and cut the double tenons (and learned about – and learned to love – holdfasts in the process), and Jason should have his four legs ready tomorrow. Again tonight there should be no insomnia in the ranks, as we are finding consciousness leaving the grounds fairly early, and arriving late. Aching joints and groaning muscles are the hallmark of the morning, but once we get going we seem to be almost ambulatory. My final day on The Grand Tour began with a drive down through the heart of Boston from Andover to Quincy for a delightful three-hour sessions with JohnC, a retired historian who is doing some really heavy lifting for this project. 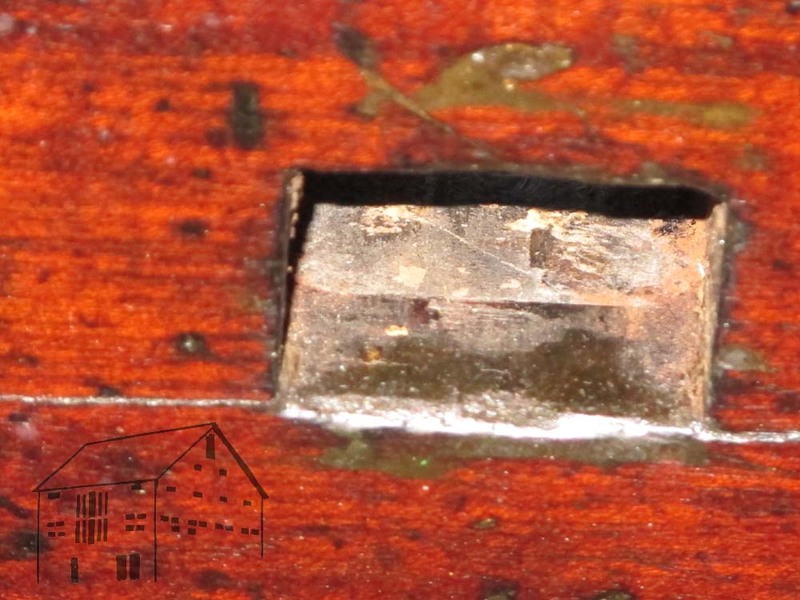 I assure you that his fingerprints will be all over the Studley history section of VIRTUOSO:The Tool Cabinet and Workbench of Henry O. Studley. We started with an hour long discussion of the project and research directions for the future, allowing ourselves free reign when it comes to rabid speculation about Studley the man and his life and tools. 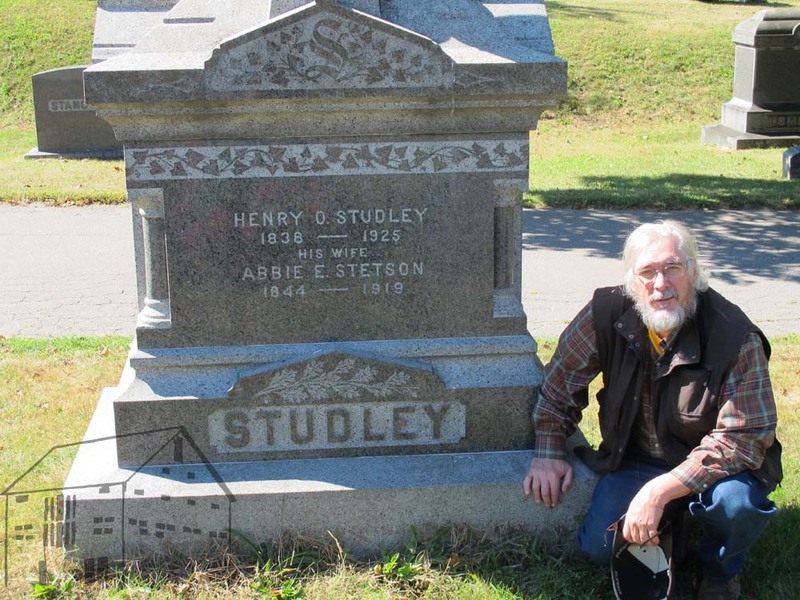 With that out of the way John drove us to the site of the home Studley shared with his wife and the Stetson family. That site is now the home of the Crane Library, a stunningly beautiful public building. 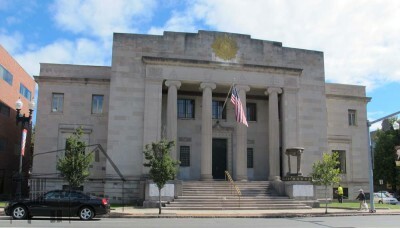 We followed that with an extended walk around the outside of the Quincy Masonic Temple. Studley was a member of that Rural Lodge housed in that building, but we do not believe that he ever saw the current building which was dedicated shortly after his death. The building appeared to be completely unoccupied, and we had no luck trying to call (the phone number had been disconnected), emailing, or knocking. There was nobody home. A short stop at the Studley grave site and the Quincy Historical Society wrapped up the business portion of the day, and John took us to his favorite burger joint where I ate a hunk of bison. We parted shortly, and I drove non-stop ten hours to home base. Or should I say, I drove stop-and-go, and stop-and-go, and stop-and-go. I have been told that New England has two seasons – winter and road construction – and I am now a believer. Four days after my return I received from John the astounding news of a catastrophic fire at the Quincy Masonic Temple, apparently destroying much of the interior and all of the Masonic memorabilia and Lodge records. Thus what we hoped would be a rich resource for John’s research will remain lost forever. The final big day of vise-gawking took me to southern New Hampshire in the morning and Boxford MA in the evening. After making my way from Nashua NH heading west to the shop of BillT I encountered two nearly identical yet dramatically-different-from-the-rest vises, which were not connected to benches just yet. The truly fascinating thing about these vises was that while their general configuration matched the rest, the moveable jaw and the moving platen were not a unified casting, but rather the jaw was attached to the platen with bolts. 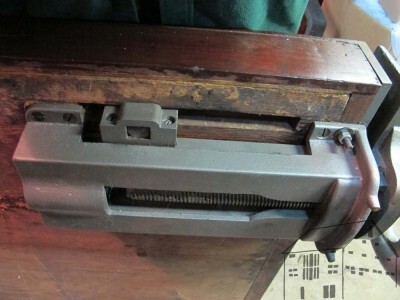 In addition, there was a fixed rear jaw, whereas each of the other vises used a metal plate screwed to the bench itself. It was a thunderbolt, a thunderbolt I tell you! This manner of construction is technically immensely easier than casting the movable unit as an integral whole, and I had been noodling this design in my fertile (or is it fertilizer-filled?) brain for some time yet is the first hint I have seen of this design being manifest in iron. Like others on this quest these vises were beasts, with the wheel cross-section of 1-1/2” pushing the total weight up to the 85 pound region. 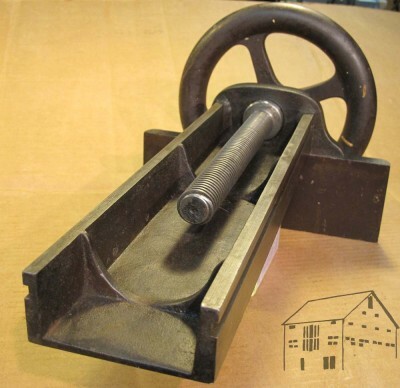 Again, these vises have a probable lineage to a piano factory in Peterborough NH, even though they were purchased when an old box factory closed some years ago. On leaving Bill’s shop I was so energized at the possibilities that I barely noticed the drive to Boxford. There I met up with Freddy Roman to visit the shop and home (and vise) of DanD, whose glorious wife prepared a meal that had us waddling for the rest of the night and into the next day. Dan’s vise was very similar to Philip’s, and due to time constraints I did not have time to photograph it properly. 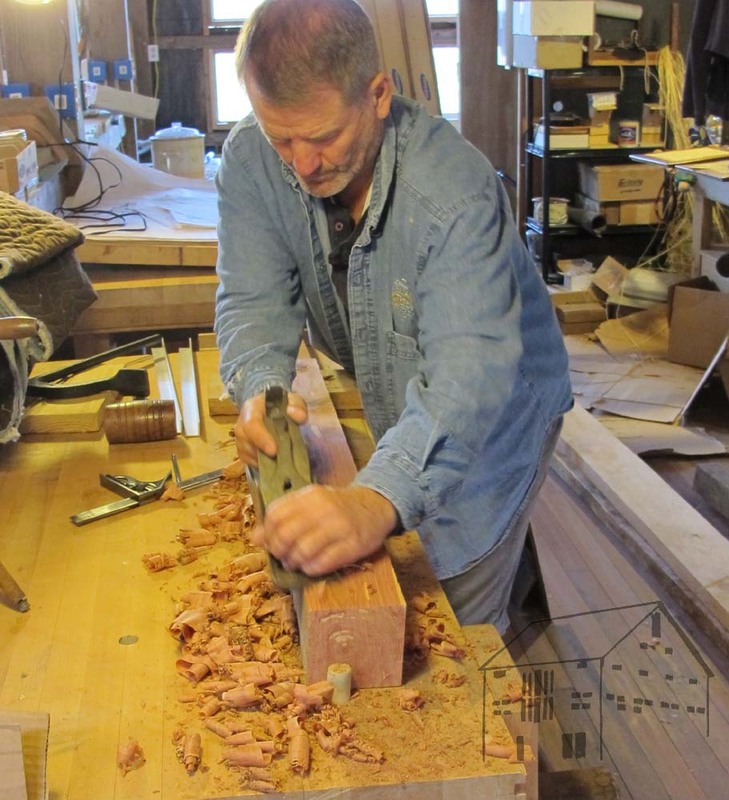 We also spent probably too much time touring his homestead and shop, ogling his pile of superb oak lumber for an upcoming Roubo bench, and picking up a great many inspirations and good ideas during our visit. Instead Dan volunteered to let me bring his vise back home with me on loan to study further, which I will do over the coming months. Even better, he volunteered to carry it to my truck for the ride home. Now that’s a classy guy! My fifth day of the Grand Tour took me to Bangor, Maine, where I met Tim Cottle for breakfast. He said that I had to experience the local flavor of Dysart’s, a famed local eatery at a truckstop just south of town. He was right. The artery-clogging breakfast was fantastic! Good thing I am fan of Gary Taubes. After breakfast we headed into town to visit a friend of Tim’s, tool collector and maker Tom Christenson, whose showroom and tool-making shop were surely the envy of all who have seen it. Tim’s generosity last winter in loaning me his version of the piano-maker’s vise was a huge catalyst in starting me down this road. It was the first time I got to REALLY look closely at the form, and I spent hours cleaning it, taking it apart on my bench, and photographing it. 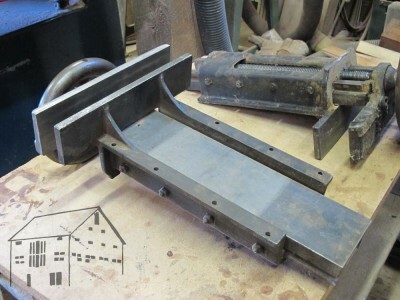 Tim’s vise is and end vise unit, missing the dog shuttle or “collar” used for the movable dog (see the previous post on Alan’s vise from Day 1). These pictures are from last spring, but my time with Tim was again a delightful interlude. Following my time in Bangor I headed south to the coast where I was to spend two days with new-old-friend Joshua Klein and his family on their newly emerging homestead. 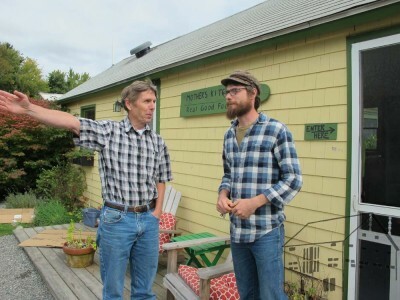 While I doubt my wife and I could live in Maine, if we had to it would be at a place like Joshua’s. Pond, gardens, greenhouse, chickens, and goats. And, a building site where the new timber-frame shop is going up as we speak. 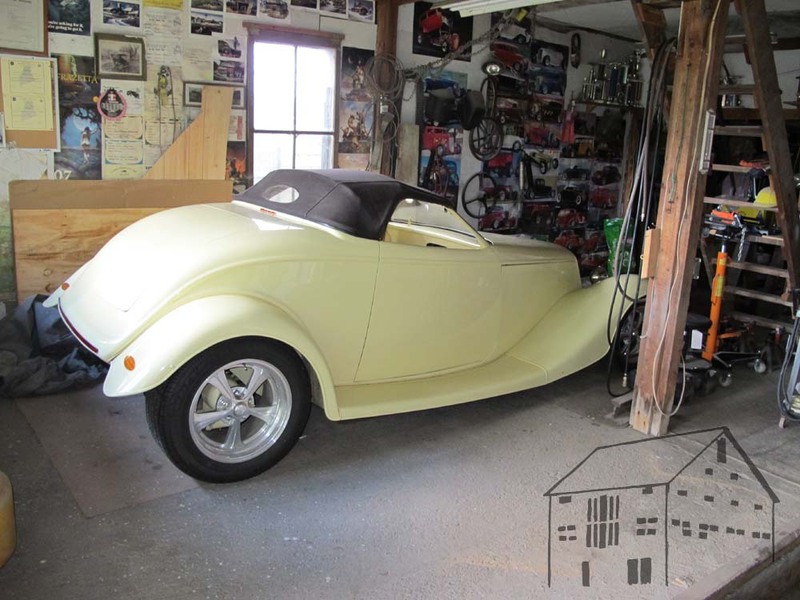 His current shop space is small, tidy, quaint, and a home to excellent craftsmanship and problem solving on a daily basis. 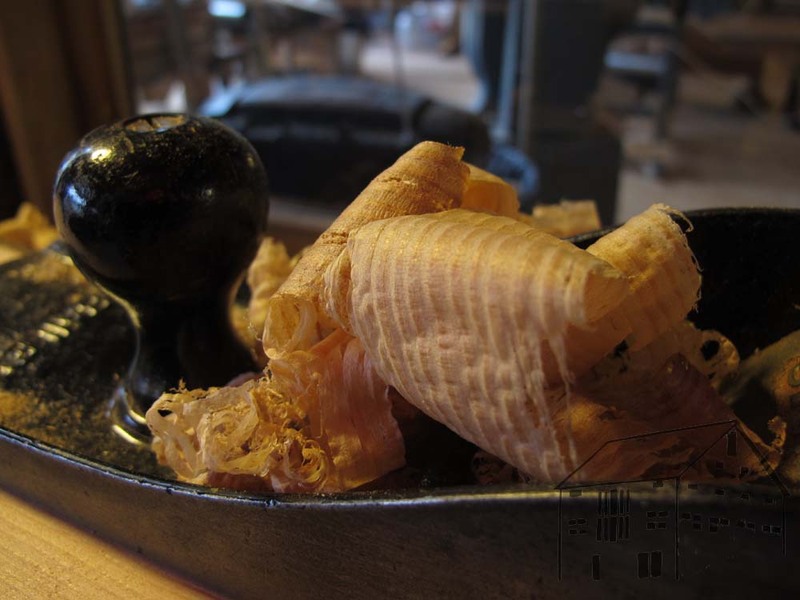 In addition to talking about all the “forbidden” subjects – religion, politics, tails-first vs. pins-first, shellac vs. polyurinate, etc. – we visited both of the Liberty Tool establishments, where I was somewhat frustrated by their lack of having stuff I wanted to buy. Either their inventory was low or their prices high, I am not sure, but I did pick up a few vintage hand saws to practice on. 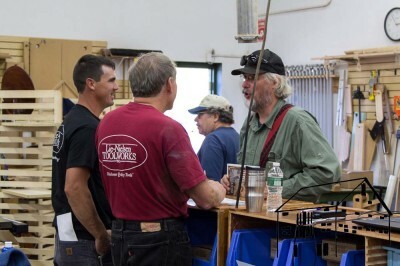 At the first Tool Barn we had arranged to cross paths with my former student Jon Brandon (on the left, Joshua is on the right) whose furniture conservation practice is also in southern Maine. For two hours we caught up and projected forward. We think we had not seen each other since Jon graduated from the Smithsonian’s Furniture Conservation Training Program more than ten years earlier. Shame on us. The next day included a trip to the Liberty Tools home base, where I was equally frustrated for the same reasons. On our way there we stopped at the Jonathan Fisher House, a museum dedicated to a pretty amazing guy. What caught my eye, among other things, was this “Roman” workbench that Fisher presumably used. Chris Schwarz blogged about these benches, and I was pleased to see one from the early 19th century Maine frontier. 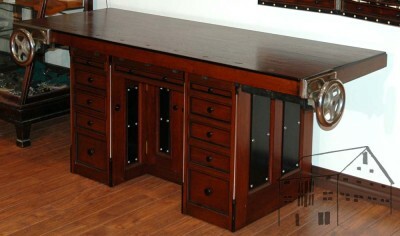 I hope Joshua is able to conduct some deeper research into Fisher’s furniture making exploits. All in all I had a terrific time of fellowship and learning in Maine, with the opportunity to spend several days with like-minded souls. I had such a grand time that another trip is scheduled for next autumn. On my way out of town I stopped at the Lie-Nielsen mother ship. If Martin Donnelly is the Spawn of Satan, Thomas Lie-Nielson must at least be Wormwood ;-). Both gentlemen empty my wallet far too much. And I remain eternally grateful to them for their contributions to the ongoing Woodworking Renaissance. 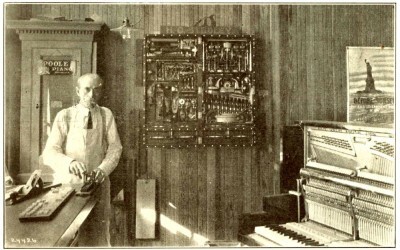 The purpose of the trip was to gather information in support of writing VIRTUOSO: The Tool Cabinet and Workbench of Henry O. Studley, but the schedule of the trip was dependent on pretty much one thing – the availability of Peter Hardwick, whose family owned and preserved the Studley ensemble for over seven decades. 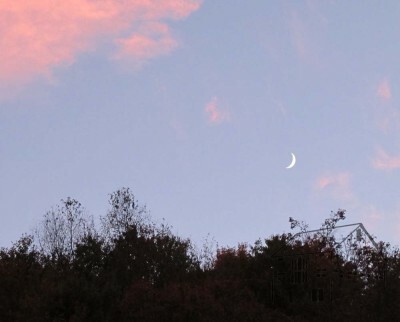 Although we had communicated by phone and email several times, including two fairly formal phone interviews, I was anxious to meet him in person. My admiration is such that the book will be dedicated in part to Pete in recognition of his family’s stewardship of this national treasure. I had hoped to visit Peter on my first research trip last February, but somehow we never managed to make the connection. That made the anticipation for this meeting all the greater. So I departed Greater Boston for our afternoon and evening of fellowship. Bless the good people of New England; there seems to be a near-universal disdain for road signs. Originally I thought it was just a New Hampshire thing, but it is pretty clear to a newcomer to New England that if you do not know where you are going nor how to get there, they would just as soon have you stay home. Pete and I arranged to meet at the local Post Office, otherwise I might still be wandering around the countryside or at the bottom of a pond somewhere. The story of the Hardwick family’s interactions with H.O. 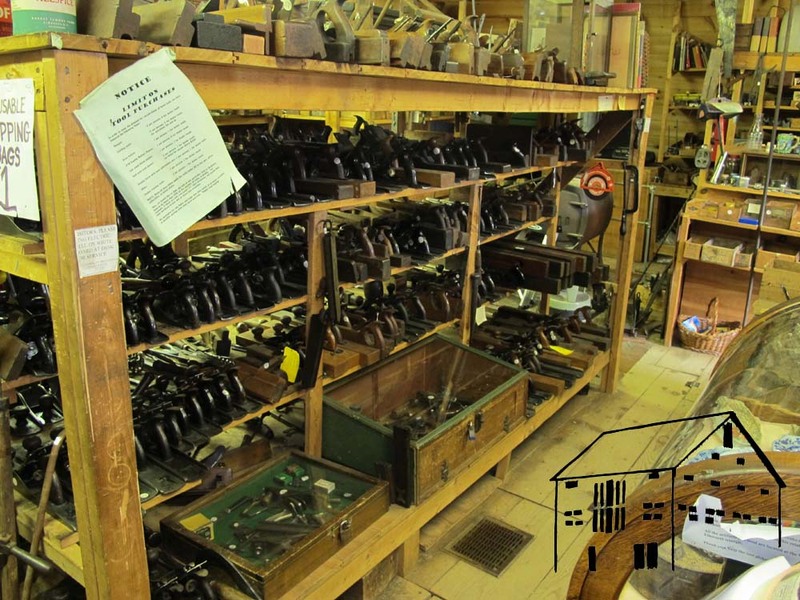 Studley, and eventual acquisition and stewardship of the tool cabinet and workbench is captiviating, but the lacunae in the family traditions makes the tale ever more puzzling. Some of the story is the stuff of historic melodrama (Studley was a prisoner-of-war in Texas during the second war of secession), with a dash of television mysteries (a murder is featured prominently in the ensemble’s history), some fairly mundane details (it hung on the wall of Peter’s great uncle’s office for years), and some of the circumstances are downright head-scratching (read the book). I intend to tell as much of the story as Pete allows, but my desire to celebrate and respect the Hardwick family is paramount. For hours Pete and his lovely wife and I talked while snacking at the dining table, walking around the homestead (we have some very strong similar interests in this regard), and later over dinner. We actually spent more time talking about Pete’s love of hot rods and antique cars and the world at large than we did of Mr. Studley’s heritage. By the end of the evening I felt as though we were long-lost friends. I am planning a return visit next autumn with my wife. I am certain she will enjoy the Hardwick’s companionship as much as I did. The second and third days of the whirlwind tour were a testament to the diminutive size of New England. Having driven to and from south Texas a month before (35 hours of driving each way), it was a bit of a shock to get from one place to another in an hour or two. I began this leg by going from southern Rhode Island to the northern end of Cape Cod, a drive I guessed would take four hours. I forget that the maps in the highway atlas are not all the same scale. 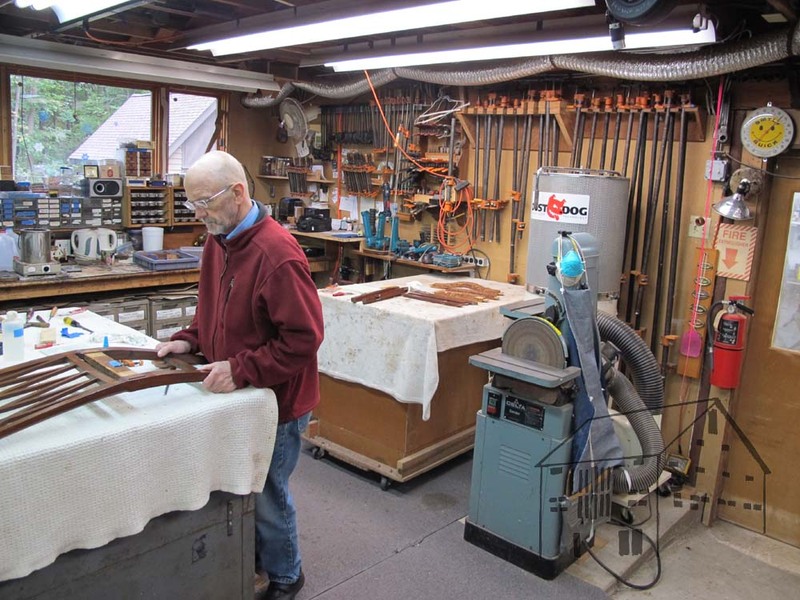 An hour and a half after shoving off I pulled into the driveway of PhilipH, whose elegant new workshop houses a fairly traditional furniture-maker’s bench with a piano-maker’s face vise in the typical left side position. 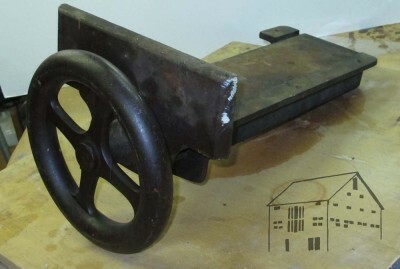 Again, Philip’s vise was of the similar form and function – integrated casting, sliding drawer platen, 9-1/4” wheel, ~16″ opening distance — yet retained some unique features. The enigma of these vises grows the more I learn. There were a couple of numerical markings on the vise, but nothing else to provide clues as to who/where/when it was manufactured. A couple of hours and about three dozen photographs later we wrapped up our work for the day, and following a delightful hike through a nature preserve we returned for dinner. 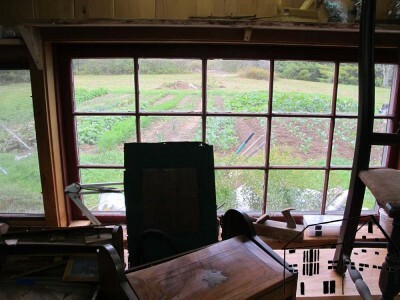 The next morning I left with the intent of a short visit with Peter Follansbee at Plimouth Plantation. 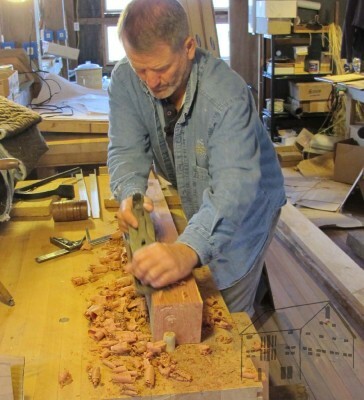 I spent an enjoyable hour with Peter, and the subject of the Lie-Nielson tool confab that day at the Connecticut Valley School of Woodworking came up. Being from non-New England I assumed it would be too far to get there. Peter assured me that my path would take me within an hour of CVSW, so off I went. I’m really glad I did. At the tool event I had a chance to chat with Matt Bickford, and an enriching almost-hour of chatting with tool-history-researcher extraordinaire Jeff Burks (who took this picture of me with the Lie-Nielson folks), a frequent contributor to Chris Schwarz’ blog. Jeff has a keen interest in the development of the woodworking vise, and is turning his razor-sharp eyes and mind to the peculiarities of the piano makers’ vise. I can hardly wait to see what he will turn up. Departing CVSW I made it back to the I-495 loop around Boston for the evening rush hour, but still made it to long time friend BruceH’s house north of the city in time for dinner and delightful fellowship with Bruce and his lovely wife Renee. 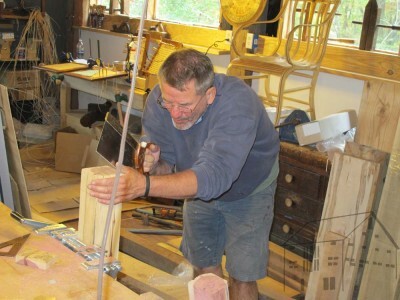 Bruce is a superb furniture restorer from whom I have learned much over the two decades of our friendship. His elegant, compact shop is under the house, and he has made his living there for almost three decades. 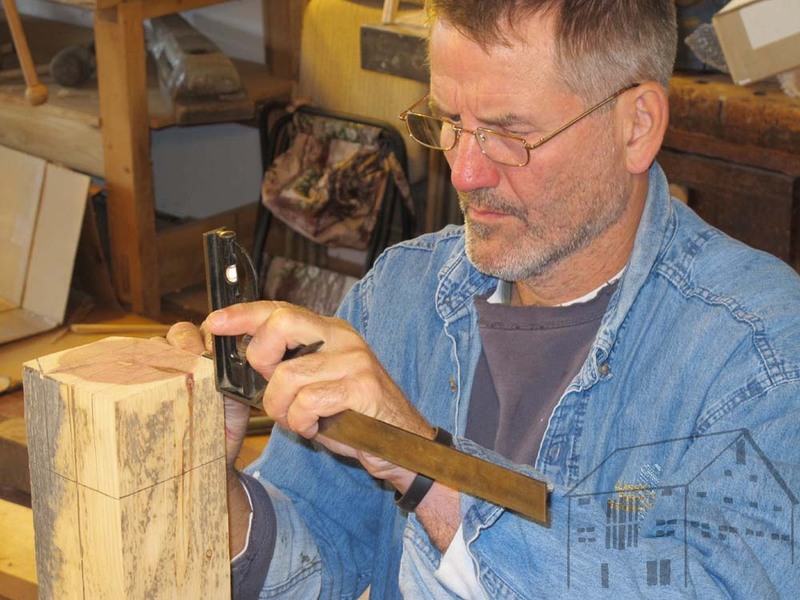 The first stop on my grand tour of New England was in southern Rhode Island, where AlanJ was patiently restoring a recently acquired piano-maker’s bench with two similar vises, one configured for the face position on the bench, the other for use as an end vise. I first became aware of this bench many months ago when a friend notified me of its presence on Ebay (this photo of the bench with red-handled vises was from the original listing). Jameel Abraham and I discussed at length the possibility of purchasing this bench, but in the end we dithered long enough for Alan to purchase it before we could make up our minds. Alan’s new (to him) bench has an iron clad provenance, purchased from the descendents of a known piano maker and a documented home base of the Emerson Piano Company of Boston, along with some notable similarities to Henry Studley’s workbench (pictured here). He has even begun to compile historical research about the piano maker, which warms my heart. After my tracking him down, Alan has been nothing but generous with images and background information. With his invitation in hand I headed north from The Peoples’ Republic of Maryland with Rhode Island as the home to the first of a half dozen vises I would study on this trip. The bench itself was so similar to Henry Studley’s workbench that it is nearly inconceivable to me that the makers of these two benches were not working from the same playbook. 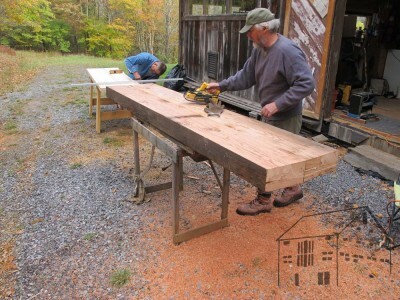 The top of Alan’s bench is a surface of two magnificent planks of Cuban Mahogany — hard, dense, and beautifully figured. These 5/4 planks are laminated onto a 3” core of white oak. Altogether they weigh about three hundred pounds. Add the two 80-pound vises and you are up to almost 450 pounds. Studley’s bench is made of solid Cuban mahogany, but glued up from five slabs. 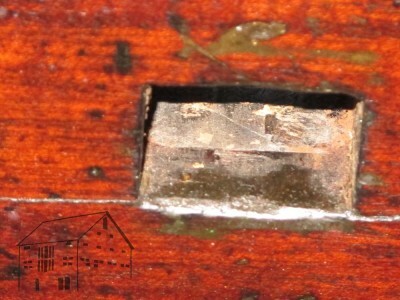 The edges and corners of this bench are an ebonized oak strips about ½” square, while Studley used actual ebony. 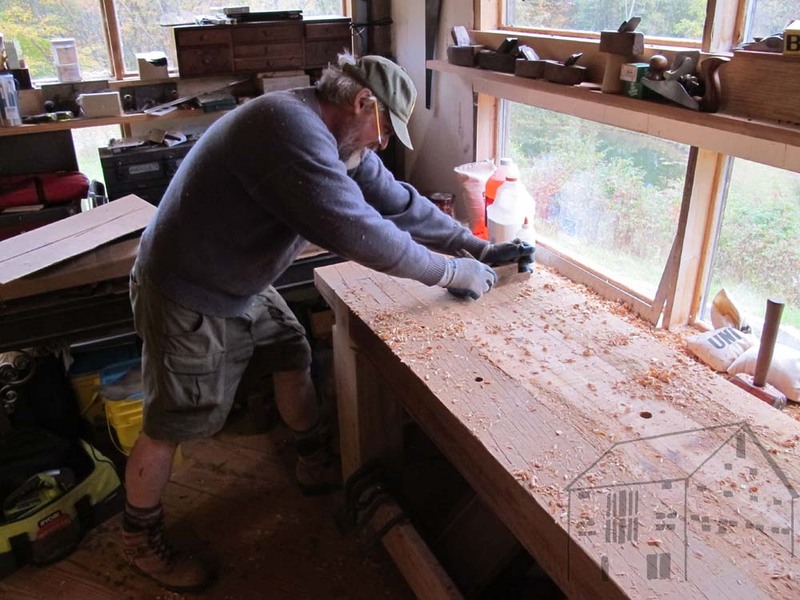 The dog holes on Alan’s bench are actually mortises chopped directly through the entire slab, while Studley’s are blocks in a glued construction method. 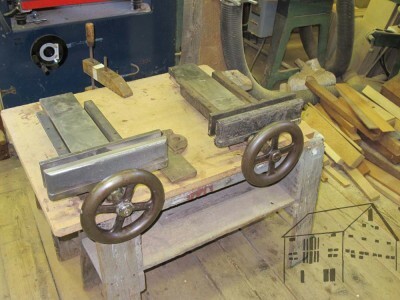 The vises of this bench were of the correct form and general configuration; a unified casting of the face jaw and the sliding platform “way,” a generous 9-1/4” wheel handle driving a twin-lead 1-1/8’ x 3 tpi Acme screw for fast, smooth action with a robust clamping when engaged. 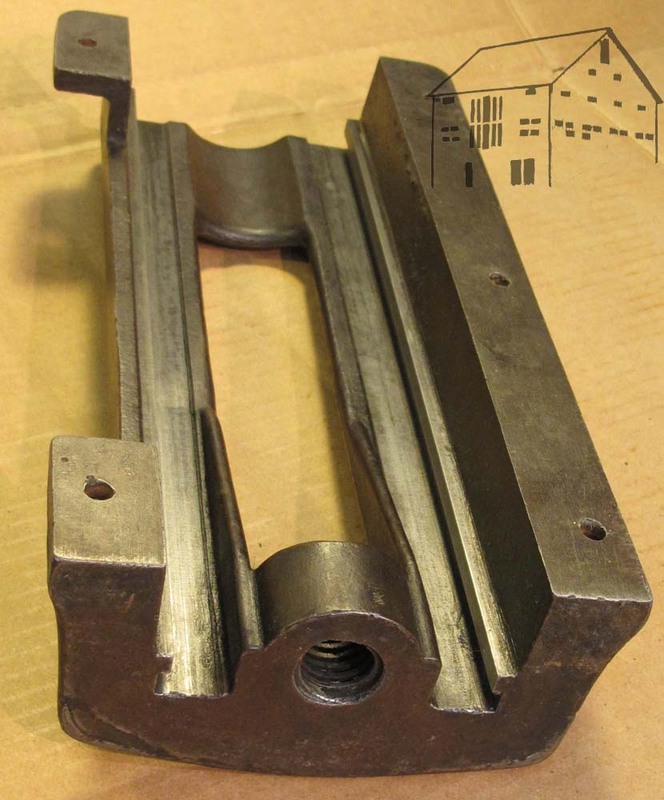 The face vise opens about 16”, which is emerging as a standard dimension for these vises. 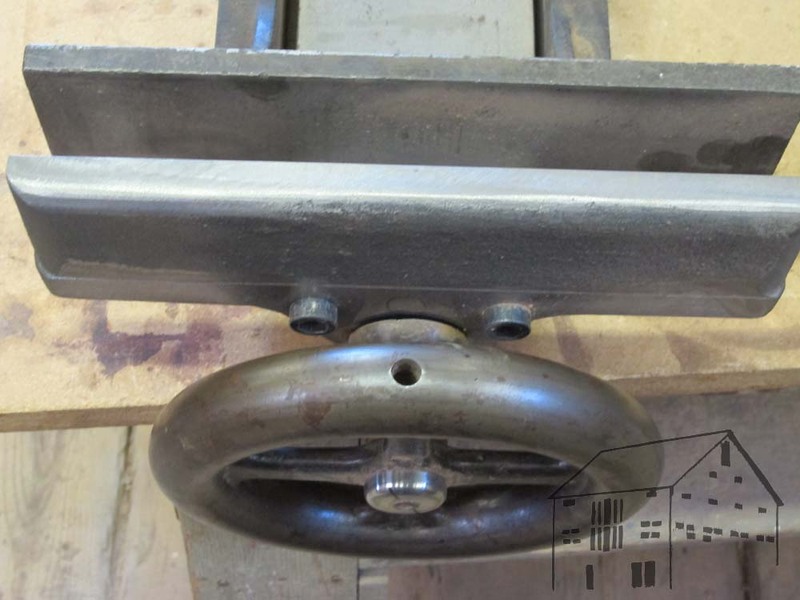 The tail vise has a collar affixed to the sliding “drawer” which allows for a dog to project up through the top. 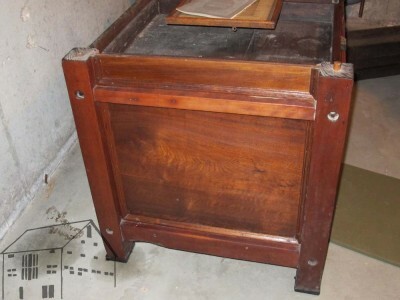 The base is similar in concept to the base that came on a bench I bought last summer in that it is clearly a “knock-down” cabinet that was ordered from a commercial vendor (note the four connecting bolt), and the top was made to fit this base. Studley’s base was long lost, and the current owner of the Studley bench fabricated a new one based on the shadows on the underside of the bench top and the aesthetic details of the tool cabinet. All in all a magnificent start to the trip, and I look forward to Alan’s reports of his ongoing restoration of the bench and vises, which now have a pewter-ish appearance. I hope to get back to re-visit the restored bench next fall. 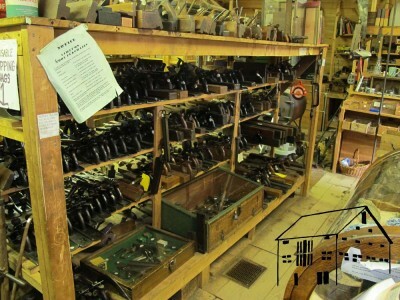 I have just completed a whirlwind trek around the alien planet called Gnu Ongland or something like that, in a quest to gather more information about the life and tools of Henry O. Studley as I get myself primed for completing the manuscript for VIRTUOSO, my book about Studley’s tool cabinet, his tools, and his workbench. 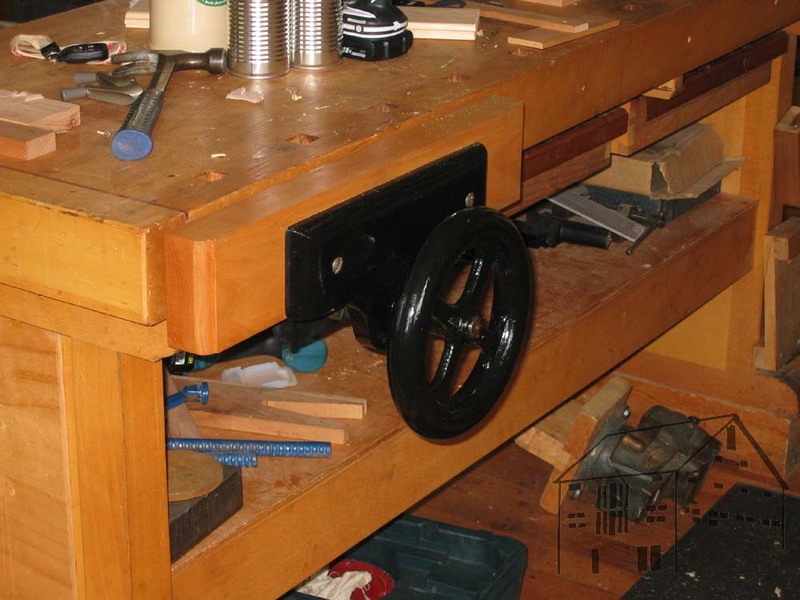 As you may know, I have become what some folks would call “obsessed” with the style of workbench vise found on Studley’s bench. I am not obsessed, I am merely hyper-interested. My first in-person encounter with this style of vise – I now know is referred to as a “piano-maker’s wheel handled vise” — was when I entered into the presence of the Studley ensemble for the first time three autumns ago. Admittedly I knew little about this tool form, and have been trying to resolve that shortcoming in the intervening years. Since then I have learned of almost twenty examples of this vise, many of which have a provenance founded in the piano-maker’s trade. For the rest, I simply do not know of the history for the vises. This trip was primarily to examine and photograph a half dozen of these vises, the genesis of which is, at this point, mostly unknown. An earlier trip last winter was for the same purpose. One of the truly intriguing elements of this quest is that these vises are all “of a type” yet no two are identical to each other. None have any maker’s marks, although a few have some inventory (?) numbers stamped on them. There are clearly two general types of wheel-handled piano vises; end vises and face vises. While they appear alike on the surface, they are different underneath. With each one slightly different than all the others, a number of questions arise. Who made them, and why are they similar yet unique in more than incidental ways? It is clear that these were a well-known type, of similar form, yet they were made by numerous different patternmakers, foundries and machine shops. Over the coming series of blog posts I will be recounting the examples of the vises I have found thus far, in part to “think out loud” about them, in part to get out the word that I would like to learn more and learn of additional examples and histories.